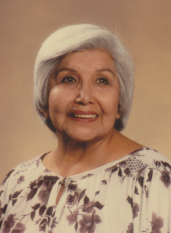 Rose Dorothy Ringlero, widow of saddle maker, Mervin Ringlero, and mother of art historian Aleta M. Ringlero of Scottsdale, AZ passed from this earth on Friday, November 7, 2014. Rose, an enrolled member of the Gila River Indian Community, was the daughter of Charles Laws and Sarah Nelson of Phoenix. A graduate of the Santa Fe Indian School, N.M., she enlisted in the U.S. Navy WAVES training as a riveter at age 21. An avid student of classical ballet and the fine arts, she resided in Van Nuys, CA with her family for thirty years before returning to Arizona in 1982. Public visitation and funeral services are scheduled for 8:30 a.m. on Monday, November 17, 2014 at the Salt River Indian Community Memorial Hall, 9849 East Earll Drive, Scottsdale, AZ followed by a 2:00 p.m. internment at the National Memorial Cemetery of Arizona, 23029 North Cave Creek Road, Phoenix, AZ. Rose was 91 and a unique and beautiful presence to those who knew and loved her. Arrangements by Bunker’s Garden Chapel, Mesa, AZ.